I love what I do. I love being an independent business owner. I love creating a shop of great handmade goods. I love helping customers find exactly what they need or want. It is all good stuff. But I really love when I am able to open a door for a young artist and allow him/her an opportunity to showcase their goods. Last week one of Halifax’s fabulously talented painters, Kyle Jackson, came into the shop with his 16 year old daughter Lily. Lily is everything awesome about being 16 – full of promise, hope, and enthusiasm with just the right sprinkling of edge and coolness. Well, Lily received a sewing machine for Christmas and has been creating little owly bird creatures for her friends out of her old tee shirts and other fabric remnants. She was in to see me to see if she could take her hobby to the next level. I loved Lily and owls right away – fun, silly, colourful, charming, and awkward. As Lily and her dad left the shop, I could see them high-five outside the shop. And then he ruffled her hair. Seeing that moment reaffirmed that I LOVE what I do. Other notes: 1. Kyle Jackson has some very fun folk-art love horns here at the shop. They are a super awesome affordable sculptural artwork perfect for any home or business. (Jane’s on the Commons has one!) and 2. 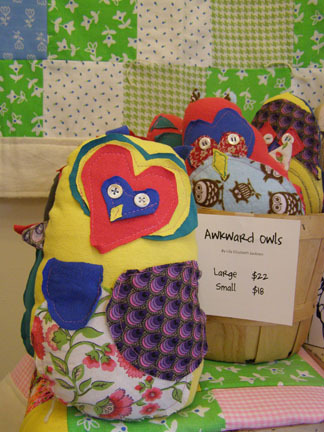 Lily’s awkward owls are photographed in front of local gal Sharken Design’s vintage and reclaimed cotton baby quilts. What an awesome image. I too feel lucky to own a business that puts smiles on people’s faces. It’s a beautiful feeling.